Throughout life each of us meet people. Some we categorize as acquaintances or co-workers, others we disregard entirely. Every now and then, though, a person comes along that we build a strong bond with. We regard them as friends. Some of these friends we loose track of over the years, some we have "falling outs" with and choose to never see again. Others we keep through all the years. I was fortunate enough to meet a friend, a life long friend... his name is Biff Tannen, my friend for life. Our story starts many years ago in the small Columbus Ohio suburb of Grandview Heights. My mother and Biff's mother were co-workers at the West End Insane Asylum and Waffle Bar. The two women had frequent Avon and Tupperware parties. One party Biff tagged along with his mother as well as I with my mom. We were introduced at the age of 10. We became fast friends. Biff was a bit older and much bigger than I was. I guess I felt safe from bullies as his friend. Biff was later known as a bully himself but never said a mean word to me. We stayed friends throughout elementary school right through High School. We grew apart a bit since we were both into different things. I was a band geek and Biff was a jock, star football player and State Wrestling champ. We still hungout on the weekends and saw each other frequently in school. We were both part of the homecoming crew our Sophomore year. Our float was called the "Gotta Get Back in Time Machine" based off of the movie "The Time Machine". We both Graduated in 1996. Biff had to take some summer courses in order to graduate on time but he toughed it out and received his diploma. The following Fall we both started college at The Ohio State University. I auditioned for and joined the marching band there while Biff tried out for football. He didn't make the team and was very upset. This was the true beginning of Biff's downfall. He never quite got over being cut... in his mind he was the best player they had. I remember him beating up OSU's backup kicker one night at a party. The kicker made a comment to Biff about him not being tough enough to play ball at OSU. Well needless to say that kicker now drinks all his meals from a straw and only has a 37 second short term memory. Biff dropped out of school to work at his father's used car dealership (Buford Tannen's Cars 'n Stuff) They specialized in classic cars and sold caned meat as well as jellies and jams. I graduated in 2001 and started working for Verizon in Westerville Ohio. Biff and I still made time for each other and he set me up with a good deal on all my cars. He even drove the limo for Sarah and I's wedding. 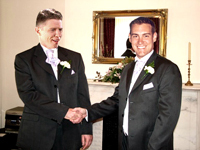 Though I did see Biff at the back of the reception hall with a bottle of Jack Daniels and a tear in his eye. I know deep down he still cares for Sarah, but is too good a friend to show it. And that is were we are today... best friends. And best friends we will remain.